A woman in her 50s has been arrested after an incident at Government Buildings this morning. 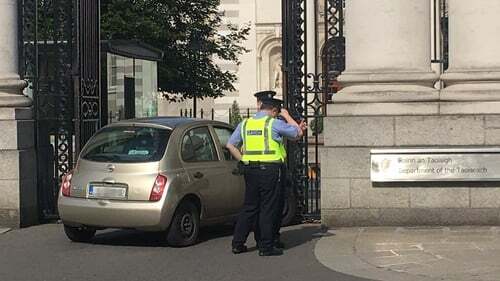 It is understood the woman attempted to drive a Nissan Micra through the gates on Merrion Street. Gardaí arrested the woman for criminal damage and she was taken to Pearse Street Garda Station for questioning. There was only minor damage to the car, and there were no reports of any injuries. One person who witnessed the incident said she heard a bang before seeing the car at the main steel gate. The woman, who did not want to be named, said: "There was confusion over what happened. "There was a bit of commotion as people didn't know what happened. A few people went to the driver to see if she was okay but she didn't seem to be injured." A spokesman for the Department of Taoiseach said: "We understand this matter is now under investigation by the gardaí and therefore it would not be appropriate to comment further."